There’s another bunker that doesn’t seem interesting at all. An iceberg on a small island southwest of the Fortnite island has melted. It was there, southwest of Happy Hamlet, for a few hours after the game’s v7.20 update went live yesterday. Instead of revealing something exciting, though, it was just hiding a bunker that players are unable to open. This is just another weird event that happened after yesterday’s update, along with the mysterious ice sphere floating high in the sky over Polar Peak. But this simple bunker left Fortnite players theorycrafting about what it could mean for the end of the season based on the game’s history. 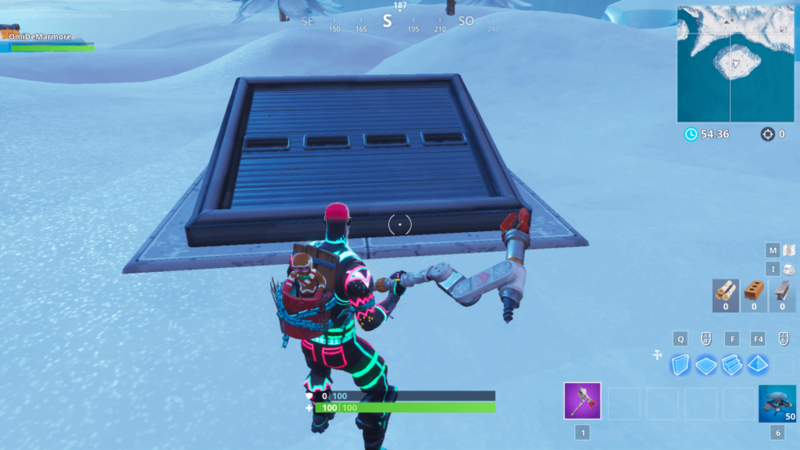 In season five, a similar bunker appeared north of Wailing Woods. Players were unable to break it open or go inside, and even with glitches that allowed players to enter it, they found it was just a hole. That bunker is still there, but now it has a fellow bunker southwest of the map that behaves the same way. Someone already got inside it, too, and found that it’s just a hole. This could mean that developer Epic Games is preparing something for these areas that will either look or be the same in both places—or that they will somehow be connected in the future. We’ve seen warps in Wailing Woods teleporting players to the houses spread around the area, so it’s not a stretch to think that Epic could do something similar with spots on opposite sides of the island. Other than that, we don’t have many clues. We just know from reports that the iceberg that was hiding the southwest bunker had a health bar that was going down as players in all Fortnite matches were hitting it. In an individual player’s match, it looked as if the iceberg was passively losing health—but the game seemingly added up the damage dealt to the iceberg in other servers to show it in every match. This might be a clue that whatever is the story behind this bunker, it might also be interactive and include players on all servers simultaneously. Until more events unfold in Fortnite’s season seven, we’re left to theorycraft the meaning of the bunker. Epic might add new clues to the game as days and weeks go by, but until then, a bunker is just a bunker.